Self-Catering Accommodation on a family farm in the Overberg, near Botrivier, Hermanus, Caledon, Elgin and Grabouw. Swaynekloof Farm is a lifestyle farm set in the Botrivier Valley in the Overberg, 4.5km north of Botrivier Town. Botrivier Town is 30 minutes from Somerset West along the N2 or a little over an hour's drive from Cape Town CBD. Important : we do not accept single night bookings, bachelor/bachelorette/noisy parties. At Swaynekloof Farm, we have created an animal and plant sanctuary which we love to share with other country-loving folk. So far, we have built an 11km game fence around a large portion of the farm and already have eland, springbok, zebra, ostriches and a few ‘zen-like’ nguni within the enclosure. We also have a few sheep to keep our grass short on the slopes and to provide free-range meat for the farm. Our bird life is amazing with a wonderful assortment of raptors, weavers, water birds, hoopoo and many more. The gardens are literally a cacophony of noise during the day while the still, quiet nights are broken by the occasional ‘hoot hoot’ of our resident owls. On top of all this, we are trying to recover the renosterveld on the hills behind the farm and have seen improvement after many years of over-grazing and neglect. The farm is particularly beautiful in the winter and the fireplaces in Swaynehuis and Top Cottage are very popular on those cold, wet evenings. In the summer, the pool at Swaynehuis and the plunge pool shared by the cottages offer a welcome respite from the hot sun. Alternatively, the Botriver (which never seems to completely dry up) is a great place to chill out. We have created a picturesque picnic/play area at our favourite spot! 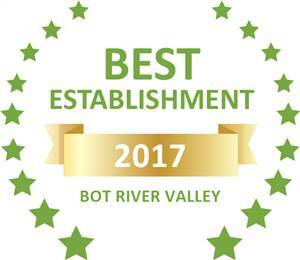 Based on reviews of establishments, Swaynekloof Farm has been voted Best Establishment in Bot River Valley for 2017.